This replacement cartridge is an ideal choice for the value conscious consumer. Its performance rivals the competition at a fraction of the cost . Proudly made in the U.S.A. 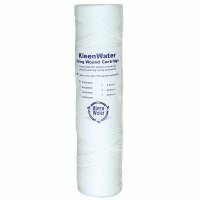 The KW2510SW is manufactured from a durable polypropylene cord that is wound around a rigid polypropylene core. The large exposed surface area gives this cartridge impressive dirt-loading capacity. Thus it can perform longer and more efficiently. The cartridge effectively removes dirt, rust and sediment. 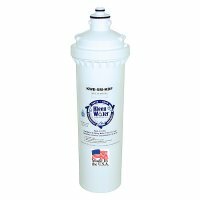 The 8 gallon per minute flow rates allow for residential applications. 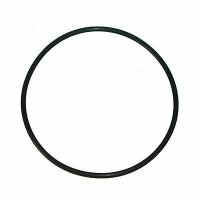 The industry universal dimension of 2.5 inch x 9.75 inch makes it compatible with filter housing manufacturers such as GE, Culligan, Cuno, and Ametek, among others. This cartridge is commensurate to GE FXWSC. The smaller the micron rating the better the entrapment capability. The KW2510SW is was formerly known as PWF2510SW.